New customer? Create an account now. General Data Protection Regulation (GDPR) 24 / 7 x 365 24 Hours, 7 days a week, 365 days a year! Jobs New Job? High Energy Magnetic Stripping is our most powerful magnetic stripping available. These magnetic strips have almost twice as much magnetic power as our standard outdoor adhesive strips. Our High Energy stripping was made with an outdoor adhesive so they can be used outdoors or indoors. 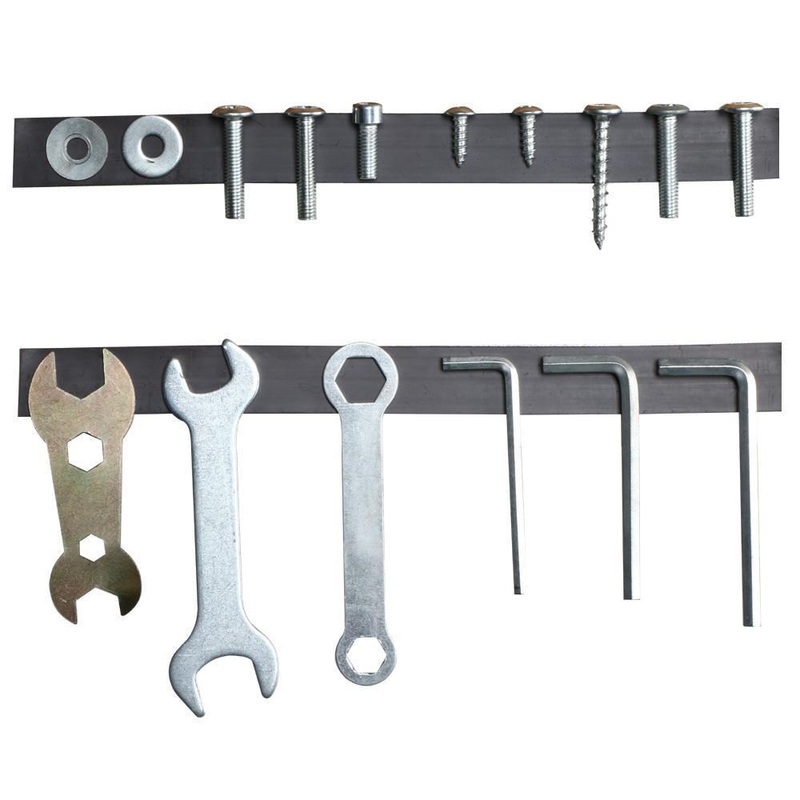 We have these powerful magnetic strips available in many sizes! The strip is magnetic on one side and adhesive on the reverse. The adhesive has a peel-off liner, which protects it from exposure to air until ready for use. The strip withstands temperatures from 0 to 150 degrees F and can be cut with scissors. Flexible magnets can be easily cut and shaped for a range of applications. They are produced by mixing powdered iron or ferrite with a rubber or plastic binder, and then extruding or rolling into the desired shape. Flexible magnets can have adhesive backing and be laminated with a printable vinyl coating. Flexible magnets are typically magnetized with multiple poles on one surface to generate a stronger holding force. High-energy flexible magnets can sometimes be used in place of ceramic materials if tight tolerances are not required. How are flexible magnet strips made? Raw materials of ferrite powder and rubber polymer resin are mixed and blended by several machines, then formed either by calendering for magnetic sheeting or extrusion for magnetic strip. The sheeting or strip is then magnetized, laminated with vinyl or adhesive, cut to size, rolled onto a core, and packed for delivery. When is magnetic tape a good choice? Flexible magnets offer a uniquely desirable combination of properties and lower cost than other type magnets for advertising specialties and lightweight holding applications. Lower energy flexible magnets perform well in a wide variety of applications for store, office, warehouse, school and home. They are easy to print on and easy to cut with scissors, knife or die. All of our magnetic sheets are unique with a protective back-coating. The back-coating is a safe barrier between the magnetic surface and the surface to which it is applied. It reduces the risk of paint damage when magnetic sheet is applied to painted surfaces like vehicle signs. It is also important to screeners where magnets must be easily removed from stacking during printing process. • > 0.010": Ideal for advertising specialties. Lower cost and light weight. • > 0.030": For vehicle signage. Strong enough for wind sheer at highway speeds. • > 0.060": Preferred for applications requiring higher strength, and thicker profile. Standard roll width: 24 3/8"
Custom roll width is available. 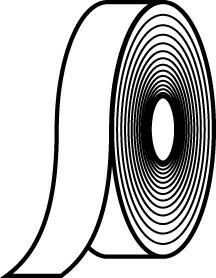 Standard roll length: 50 ft/roll, 100 ft/roll or 200 ft/roll. Custom roll length is available. A variety of high quality laminations are available that are typically applied to the non-magnetic (weak) side of the sheeting. Magnetized sheets are available in several poles per inch (PPI) configurations from 4 to over 12 ppi, optimized for specific applications. More poles per inch increase the holding strength, but reduce the reach of the field. Few poles per inch increase the distance at which the magnet attracts, but reduces the ultimate holding strength. Pole per inch capability is also a function of the thickness of the sheet, thicker sheets having fewer ppi. Magnetic strength is increased by increasing the magnet thickness. Under ideal test conditions, magnetic sheeting can be rated in approximate pounds of pull per square foot. Operation temperature range is recommended from -40ºF to 160ºF (-40ºC to 71ºC). Special properties can be achieved with custom method. Who supplies high quality Power magnetic strip 3,2mm x 24,5mm? Magnosphere offers best priced Power magnetic strip 3,2mm x 24,5mm globally to all industries, including Automotive, Aerospace, Military, Advertising, Design House, Electronic and Academic/R&D. Please inquire for custom Neodymium magnets or magnetic assembly. 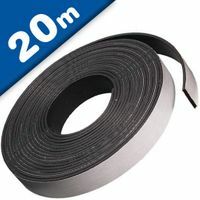 Buy Power magnetic strip 3,2mm x 24,5mm at Magnosphere and get a better deal! We can also custom manufacture these to fit your exact specifications using our in-house global manufacturing facilities and team of experienced engineers. Need high quantities of magnets at the lowest and fairest price possible? Just let us know what you are looking for and contact our Customer Care Team by sending us a request for quote! We'll work with you to determine the most economical way of providing you with what you need. Magnosphere magnet products conform to the standards set forth in EU Directive 2002/95/EC, RoHS (Restriction of Hazardous Substances), EU Directive 2002/96/EC (Waste Electrical and Electronic Equipment) and REACH (Registration, Evaluation and Authorization of Chemicals). The fields marked in bold are mandatory fields! We take a great deal of pride in providing outstanding customer care. We understand that without our customers, we wouldn’t be here. If you have any questions about your order or a general enquiry, please call or email us! info@magnosphere.co.uk - 24 hours a day including holidays! Our customer service team is available to help you! 24 x 7 x 365 - Customer Service around the clock!